It's no surprise that marketers are talking more about revenue now than ever before. Marketing is increasingly on the hook to generate (and more importantly, prove) that the programs it puts in place have a direct impact on overall revenue. Often, the budget they are given by executive leadership--most likely based on last year's numbers--is the "pole in the ground" around which all their activities revolve. 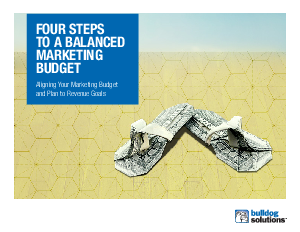 The challenge is that often this budget is spent on activities that are skewed toward the top of the funnel or that are not necessarily aligned to revenue. So how can they possibly balance this budget and prove it is aligned to their assigned revenue contribution? The key is to find the right mix of "muscle" (volume) and "brains" (improved conversion). Establish a model and framework that links marketing investments to revenue. Perform a bottoms-up reality check. Size the gap between your current state and your target revenue goal. Find the balance: Increase volume at the top of your funnel while improving conversion throughout.